If you know someone who has recently (or not so recently) experienced a significant loss, you may wish to consider sending them a grief box from the Solace Club. A great deal of thought and love has been put into designing and producing these beautiful boxes – for the purpose of helping support people on their journey through grief. I recently had the honour of receiving the “More Than Flowers” box and thoroughly appreciated the useful gifts inside. The contents included: ginger candies (yum…they were devoured within a day! ), Bach Flower Remedies candies, essential oil, a cooling eye mask, tissues, journal with pen, a remembrance bracelet, thank you cards, as well as grief cards with encouraging quotes on them. But here’s the thing: it’s the love behind the boxes that will also work wonders. The simple act of taking a moment to order a grief box through the Solace Club and having it sent to someone who is hurting may help them more than you will ever know. When we lose someone we love, it can really hurt. And sometimes we can start to feel very alone and isolated as we try to make sense of the past, deal with the harsh realities of the present and begin to forge a new – and often unwanted – future. After the death of a loved one, our world is turned upside down…and can stay upside down for years. Please click here for further details on the “More Than Flowers” box (and to order). 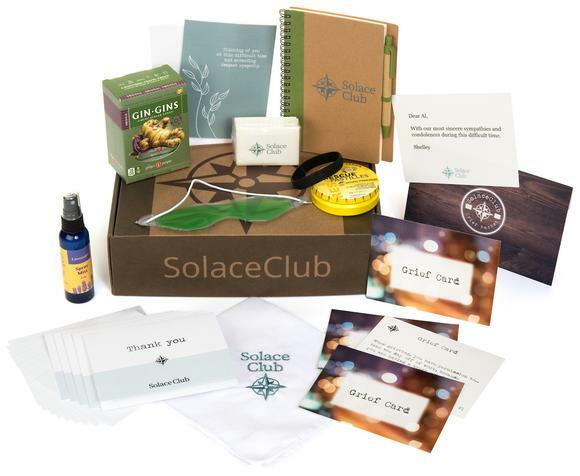 To view the other grief boxes (Self-Care, Anger, Holiday Survival Kit) available through the Solace Club, here is the link. Together, we can continue to change that.